This problem just recently started. I've tried just about everything I know to do from Checking memory, running defrag, CCleaner and System Restore etc. I use Google Chrome as default browser, and it will freeze as well as off net features like after opening Control Panel, then going to exit from it, will freeze and say Internet Explorer encountered a problem (and I do not use IE) and needs to be restarted, or will ask me if I want to wait for it to respond, close program or reload the program. But even after clicking option to just close it (and it's not even open to begin with), it will say it's sending an error report and take ten years on that, and so I attempt to close that part and it refuses to close, so I hit Escape and STILL it will not close out (freezes), and the screen will have a white haze on it. This happens with just about any part of the laptop I attempt to work on, with and use. Only works for short period of time before the issues act up. In safe mode the issues do not happen. There are no existing other users on the laptop. There is 2G Memory. Also, while in browser, it suddenly started asking me to allow cookies on sites I frequent anyhow. It's never done that before either. And prior to this, would tell me a program or something is wanting permission to add cookies or something on my computer, with options to allow, block, do not allow, do not ask me this again etc. This issue (freezing) also happens if I want to preview any pictures on my laptop. If there is anything and I mean ANYTHING anyone can provide to help me with this problem to be fixed, PLEASE by all means...ANY and ALL HELP is GREATLY appreciated! Oh and after hitting escape to get one of those windows that says it's sending an error report seems to be the only way they will close. But the white haze always shows up afterwards too. White haze and freeze happens when I attempt to close out browser altogether, and CTRL+F4 doesn't even close em out. Sounds like you may be infected with malware. Have you run any virus scans with up to date definitions, as well as run a tool called Malwarebytes to check for malware? I submitted a suggestion to moderator to move this to Computer Viruses and Spyware section where you will get help from specialists. Please do not post a duplicate post to that forum or elsewhere, this will get redirected to that section if the moderator agrees with my diagnosis of what you have for an issue based on information shared. Also, while in browser, it suddenly started asking me to allow cookies on sites I frequent anyhow. It's never done that before either. And prior to this, would tell me a program or something is wanting permission to add cookies or something on my computer, with options to allow, block, do not allow, do not ask me this again etc. In safe mode the issues do not happen. Ok Thank you very much for letting me know. Where is there a trusted site to get that tool? First of all, thank you so very much for your detailed and very informative reply! Second, you mentioned not to run any other scans while working with you on this problem. Should I turn my antivirus program off since it does automatic scans on it's own? I use AVAST!. And should I download each of those tools you added separately and run them each after each download? Or should I download them each after one another, and then run them separately as you instruct after one another? I hope that made sense lol. Oh and yes, I am able to get online on the computer we are speaking of. Out of curiosity, I've never heard of holding down SHIFT while inserting a USB device, as you described. What does that do exactly, if I may ask? You did mention temporarily shutting down any antivirus software during the JRT scan. Would that be the only time I'd do this, or should I Temp. Shutdown before performing any of the scans to avoid any conflicts? I've never seen this pop up before in Avast! antivirus program. I didn't click on anything, nor on any of the clickable links w/in any part of that which showed up, save for Close to close it out. Also, I've not had Mozilla Firefox on this machine and noticed AdwCleaner showed some things from that in it's lists. And it didn't give me an option to Delete, just to Clean. Also, I had to go back into Safe Mode in order to go here to post this, as when I tried to in normal boot, things were still freezing up, and not letting me get online using IE (before any of this posted at all to you, I Uninstalled my Google Chrome thinking maybe if I did so then reinstalled would fix the problem). I was connected to the internet, it's just that the freeze made it difficult to get online w/o freezing up with that all white haze in windows. 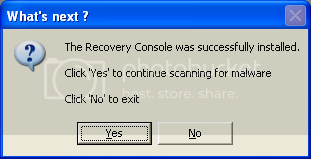 This tool didn't give me any time to say whether to restart or not. It just restarted on it's own and found 1 files infected. Should I turn my antivirus program off since it does automatic scans on it's own? I use AVAST!. And should I download each of those tools you added separately and run them each after each download? Or should I download them each after one another, and then run them separately as you instruct after one another? Please leave your AV active unless requested before running a scan. You should download and run each scanner in the sequence I've instructed. I've never heard of holding down SHIFT while inserting a USB device, as you described. What does that do exactly, if I may ask? It prevents any chance of cross-infections. Ok now I am off to do the Combofix. After all of this is done and posted logs, what then? I can tell there was something like spyware and stuff it may have caught. I just assume that from the amount of time this has all taken (not long for them at all), we caught it before it done too much damage. And will this stop all those grey little windows from popping up asking me to constantly allow, block etc. cookies? Because I've never had that before this either. And I do mean a lot whenever I go to any page online now. They just relentlessly keep popping up! Do you think I should contact my antivirus company and tell them what's going on, and ask them why these things aren't being caught like they're supposed to, as they claimed their product would also protect from? I am hoping this will soon be fixed. I have done everything you asked in the order you specified. Have not done anything else in between etc. What's next?